this is, of course, quintessential street and pub dining throughout the united kingdom. In the United Kingdom, fish and chips became a cheap food popular among the working classes with the rapid development of trawl fishing in the North Sea in the second half of the nineteenth century. In 1860, the first fish and chip shop was opened in London by Jewish proprietor Joseph Malin who married together "fish fried in the Jewish fashion" with chips. 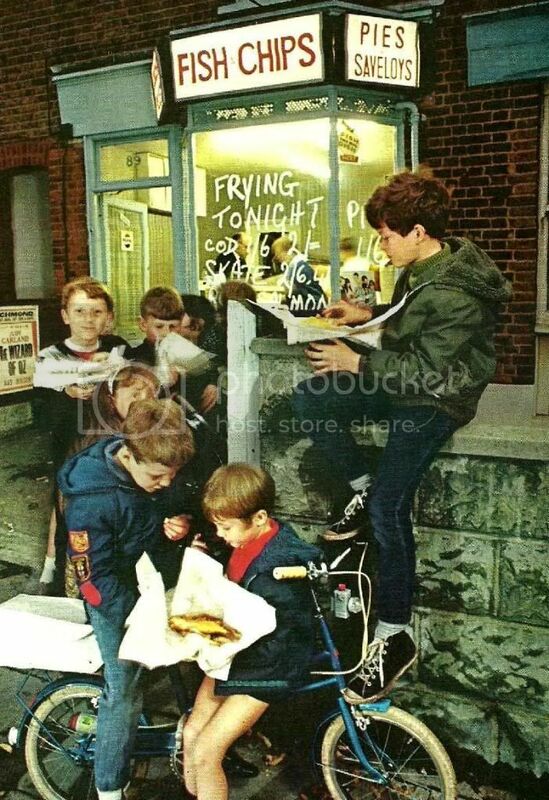 The modern fish-and-chip shop ("chippy" or "chipper" in modern British slang) originated in the United Kingdom, although outlets selling fried food occurred commonly throughout Europe. According to one story, fried-potato shops spreading south from Scotland merged with fried-fish shops spreading from southern England. Early fish-and-chip shops had only very basic facilities. Usually these consisted principally of a large cauldron of cooking-fat, heated by a coal fire. Insanitary by modern[update] standards, such establishments also emitted a smell associated with frying, which led to the authorities classifying fish-and-chip supply as an "offensive trade", a stigma retained until the interwar period. The industry overcame this reputation because during World War II fish and chips remained one of the few foods in the United Kingdom not subject to rationing. resting on the usual fish-and-chips wrapping, fried haddock and potatoes will be seasoned with salt and vinegar. to prepare the batter, pour the flour intil a large mixing bowl, make a well in the center and add the egg yolk, beer and salt. 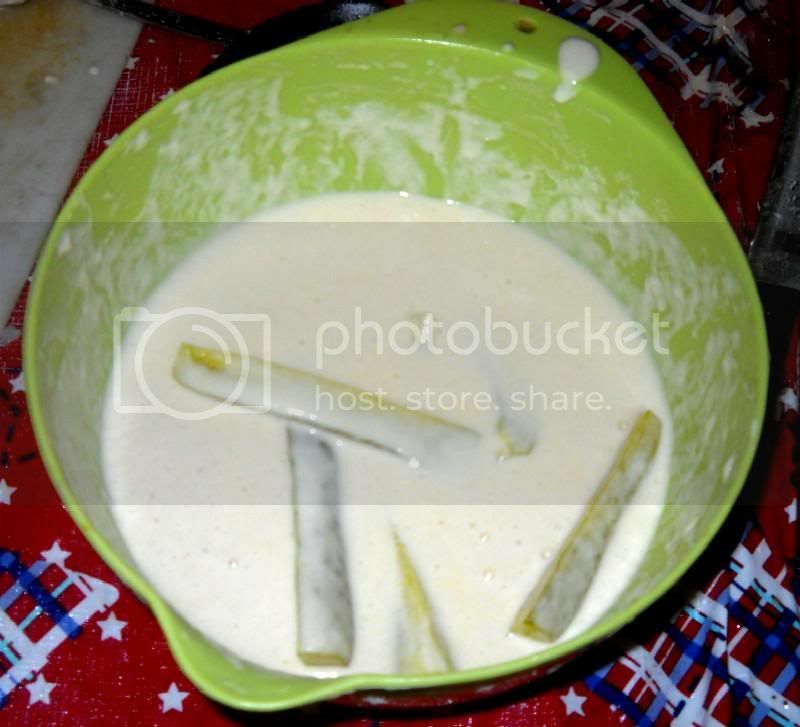 stir the ingredients together until they are well-mixed, then gradually pour in the combined milk and water, and continue to stir until the batter is smooth. 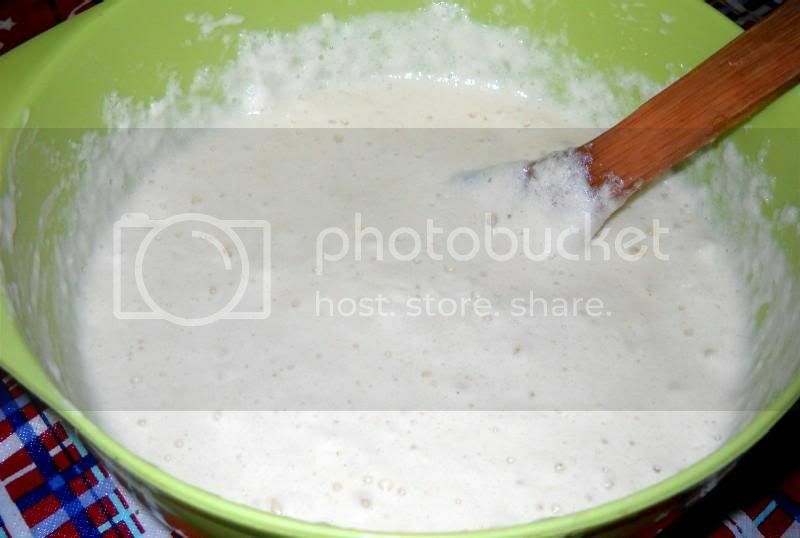 for a light texture, let the batter rest at room temperature for at least 30 minutes, although if necessary it may be used at once. in either case, beat the egg whites until they form unwavering peaks on the beater when it is lifted from the bowl. then gently but firmly fold them into the batter. 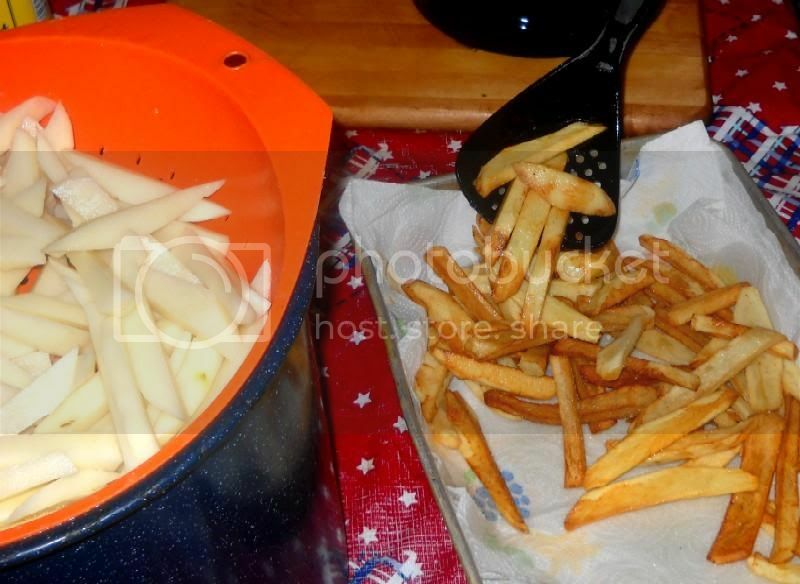 to cook the chips and fish, heat 4 to 5 inches of oil or shortening in a deep-fat fryer to a temperature of 375 degrees on a deep-fat frying thermometer. preheat the oven to 250 degrees, and line a large, shallow roasting pan with paper towels. 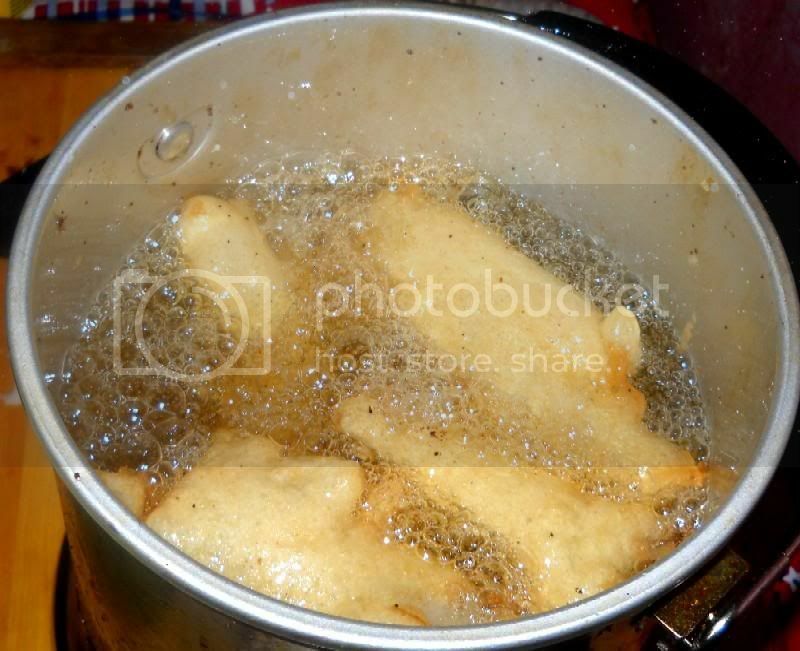 dry the potatoes thoroughly and deep-fry them in three or four batches until they are crisp and light brown. transfer them to the lined pan to drain and place them in the oven to keep warm. wash the pieces of fish under cold running water and pat them completely dry with paper towels. 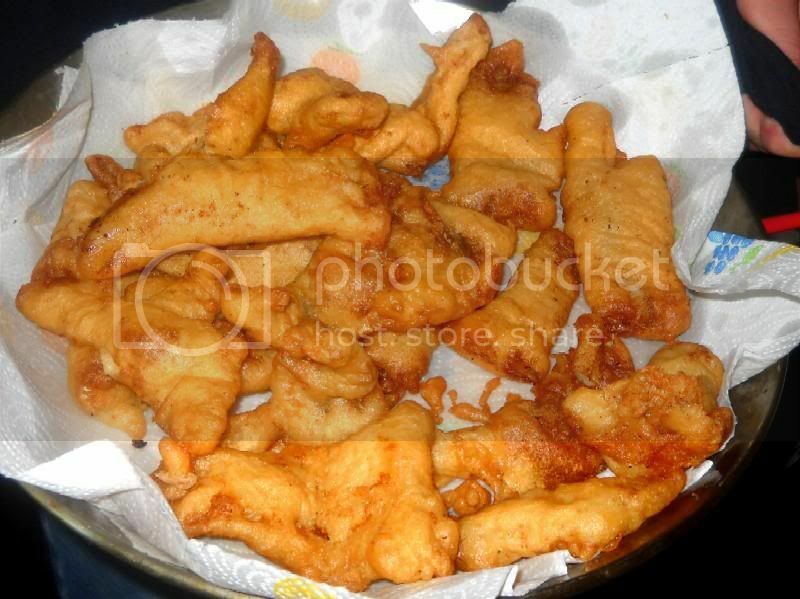 drop two or three pieces of fish at a time into the batter and, when they are well-coated, plunge them into the hot fat. fry for four or five minutes, or until golden brown, turning the pieces occasionally with a spoon to prevent them from sticking together or to the pan. 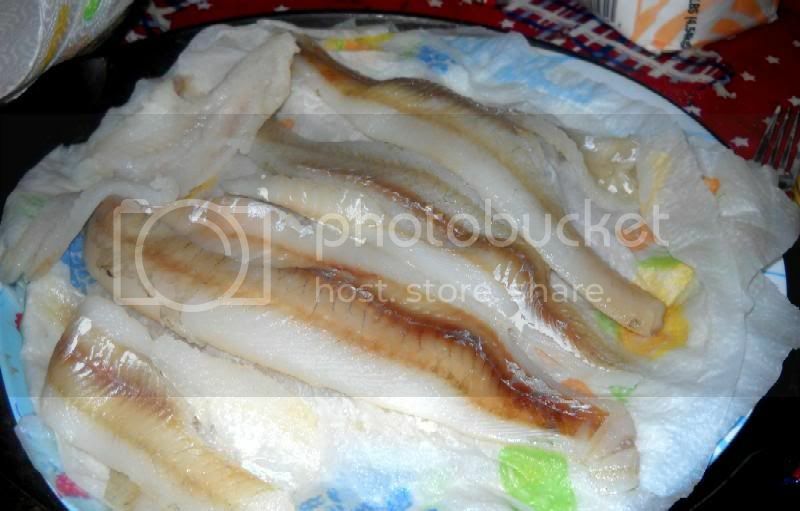 to serve, heap the fish in the center of a large heated platter and arrange the chips around them. 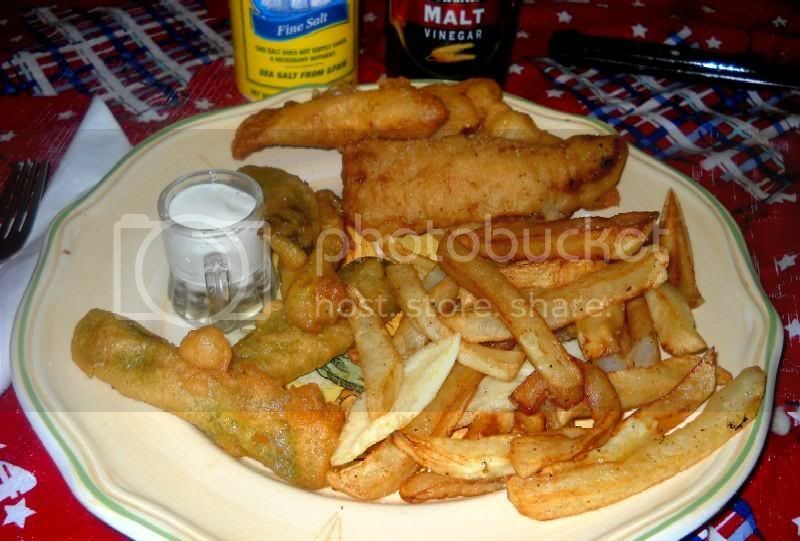 traditionally, fish and chips are served sprinkled with malt vinegar and salt. 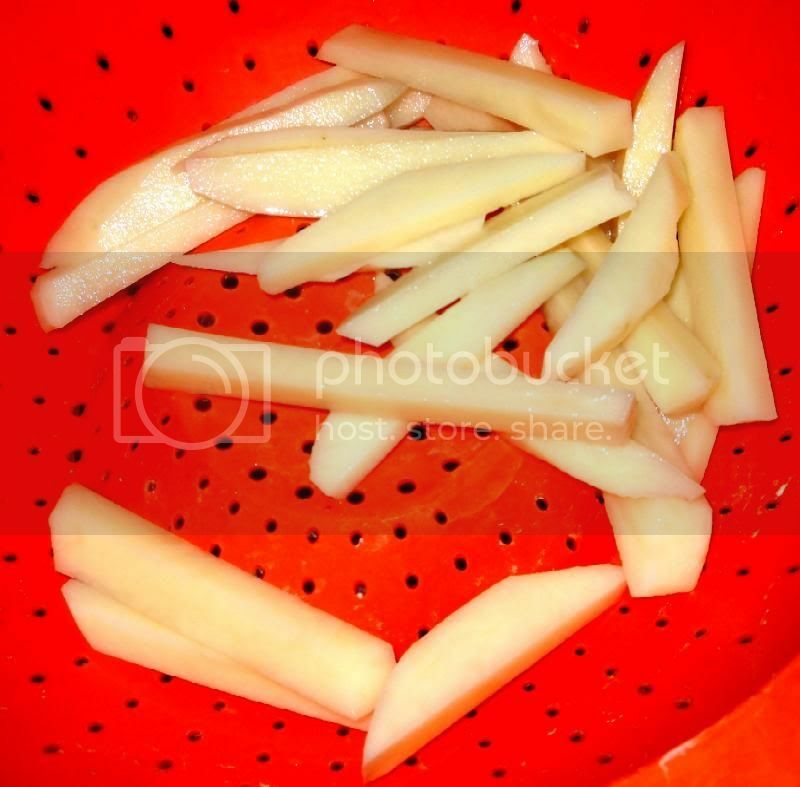 Pour all the vegetable oil into a deep pan or deep fat fryer, and heat to 300 degrees F (160 degrees C.) Blanch the cut potatoes in the oil until soft, but not colored, about 4 minutes. Remove and drain. 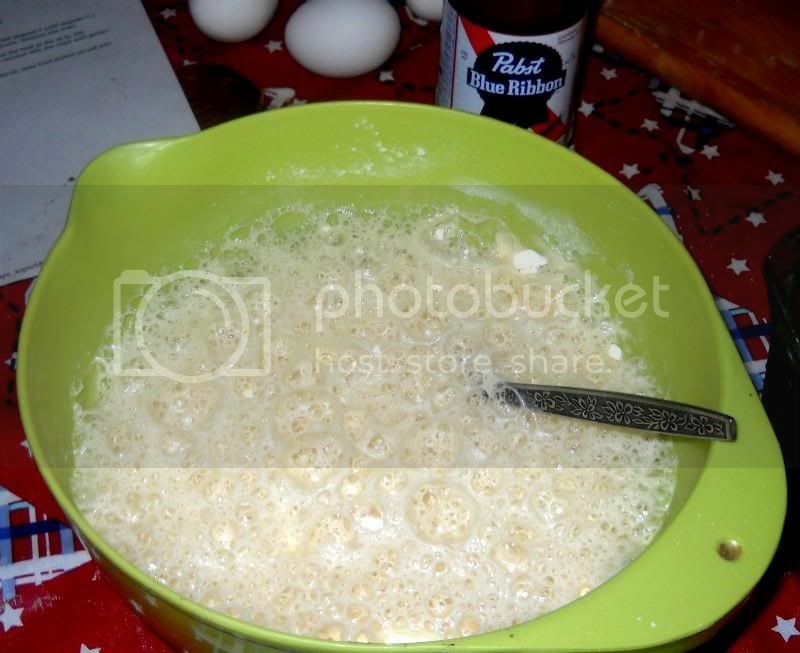 Mix together the flour and the beer, then fold in the egg whites. Turn up the heat of the oil to 350 degrees F (180 degrees C). Dip the fish in the batter and fry for a few minutes with the chips until golden brown. Drain on kitchen paper and serve with bread and butter, wally's (battered, deep fried pickles served with ranch dressing), and pickled eggs. 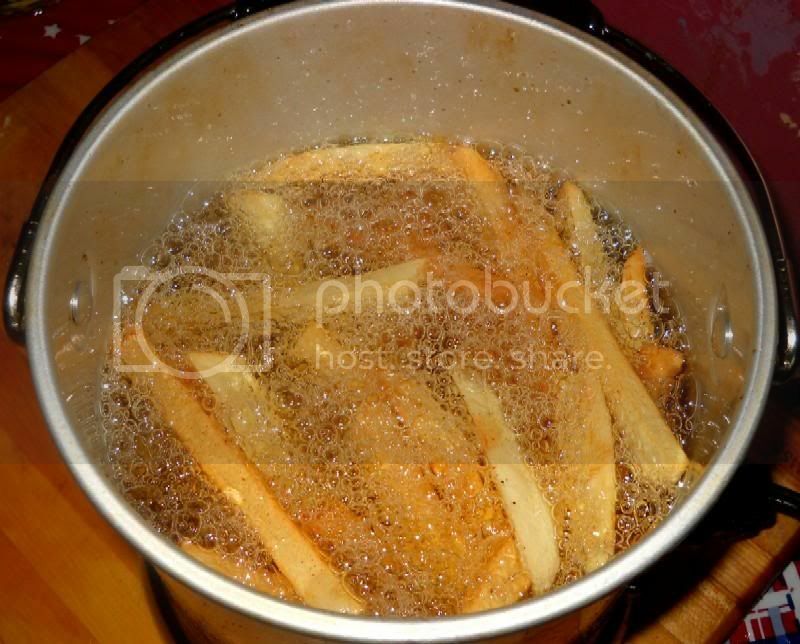 i fried the chips in canola oil in batches of a large handful at a time so as to keep the oil hot and cook them well. coming out of the fryer they were crisp outside and fluffy inside. the recipe above mentions a two-stage cooking process, but since i didn't have any oil-temperature measuring equipment handy today, i simply cooked them in one stage and they came out fine. as they finished, i put them in my trusty paella pan, also lined with paper towels, and into the oven to stay warm. they cooked up well and in short order, and as each batch finished i....you guessed it! fine sea salt and malt vinegar for the fish and chips, with ranch dressing for the wallys. everything was really good - the beer batter had a great flavour that worked well with the subtle flavours of the cod fillets. the chips were done just right and the wallys were a really good flavour contrast. 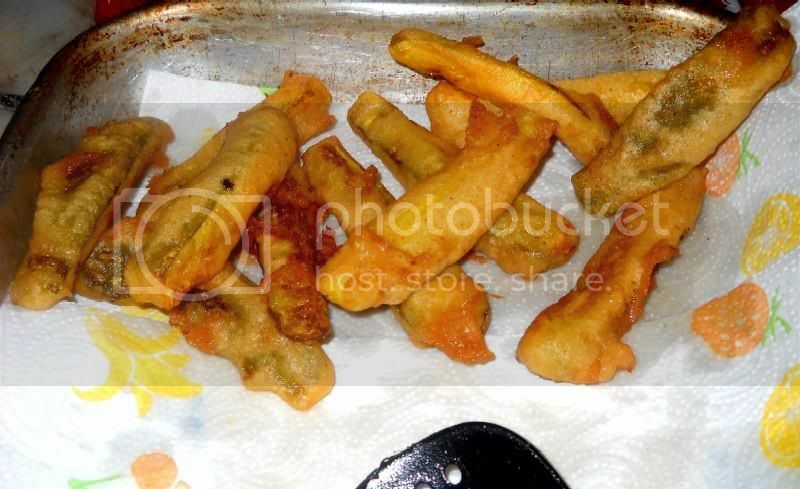 i had never heard of deep-frying pickles before this week, but i must say it was a good treat. a) prep is key! you want to have everything ready, things cut up, oil hot, pans lined with paper towels, oven warm etc. before you you begin the actual cooking! b) cooking all the chips, then all the fish, then all the wallys seemed like a good idea at the time, but in practice, the holding time in the oven resulted in food that was a bit limp and soggy; it tasted great but didn't quite rise to the level i was hoping for where textures are concerned. the moisture from the food or perhaps the oil (or both) seemed to contribute to the problem, along with the time in the pan in the oven - in spite of being on paper towles, everything was simply soggy. it all seemed cooked well and nothing was undercooked, but perhaps doing a "serving" at a time (cooking a batch of chips fish and wallys to order for each person at a time) would have been a better way to go rather than having chips and fish sitting in the oven for so long. the disadvantage, of course, is that we all would have been eating at different times rather than together. c) this is pretty basic, but i did forget this one: only fill the fryer half full of oil (i filled it maybe two-thirds full) and do small batches at a time! i put too many chip in one batch and the oil did boil over for a moment, making quite a mess. other than that, i would count this as a success, with the caveat that i would probably do an order at a time instead of everything in batches the next time we do this. everyone agreed that, sogginess aside, the food tasted great, although each had his or her own favourite condiments. ketchup seemed to be the choice among many, while others forsook the vinegar and simply used ranch dressing for everything. either way, we certainly had a great lunch on a summer day! Hey that looked like a fine meal you prepped there, Ron. Good lord that looks just about perfect! Real nice looking fish and chips. Got to have the beer for a true "proper" batter as I've been told and your recipes sounds delicious. Nothing better than fresh, hot, just-made fish and chips! Nice history you got there too, didn't know all that. Definitely adds to the enjoyment of the post! You didn't say at what heat you put the food in to keep warm- on something like this it has to be a HOT oven, and as you learned, you have to cook fast. Make batches for a couple, three then serve and keep going, but no worries, it looked fine and darn tasty~ Good to see you found some malt vinegar too. kiwi - that sounds like a good tip ~ thanks! the other thing is to make sure the water, beer, milk, anything liquid going into the batter is COLD. not sure on the reasoning, but it sure works well. i remember reading that bit somewhere. it seems to work well with other applications such as pie crusts, etc. I found an excellent malt vinegar at the market yesterday and brought it home. Sarson's, it is imported from England. A Canadian friend who's father is from the UK turned me onto malt vinegar on fish and chips years ago and I've been a fan ever since. One thing I always do when frying chips it to fry them twice. I soak them in a bowl of cold water then fry them for few minutes at at about 325 degrees until they are sort of limp and soggy then I take them out of the oil and let them cool completely, sometimes even overnight, in the fridge on a cookie sheet then I give them the final frying at 375 degrees until they are golden brown. 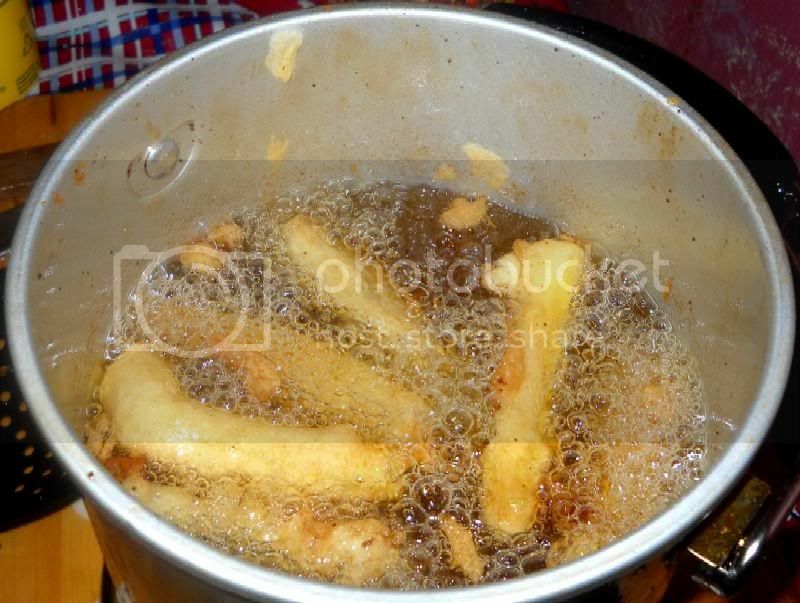 Another method which works well is to parboil them for a minute or two then cool and fry a second time in the same manner, parboiling is also much less messy. hey, andy - yep, i've heard of doing that and will give it a try sometime. the chips came out very well at first, as did the fish and the wallys, but after staying warm in the oven everything got limp and soggy fast. too bad, because the flavours were out of this world! That was a brilliant article. I nearly went home via the chippy(http://www.qype.co.uk/place/340601-Seashells-Monkseaton) It is always easier to get someone else to worry about the timings! 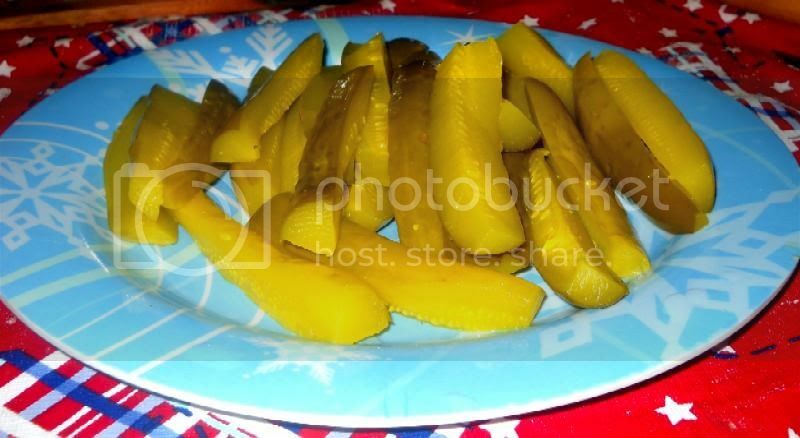 "i had never heard of deep-frying pickles before this week, but i must say it was a good treat." 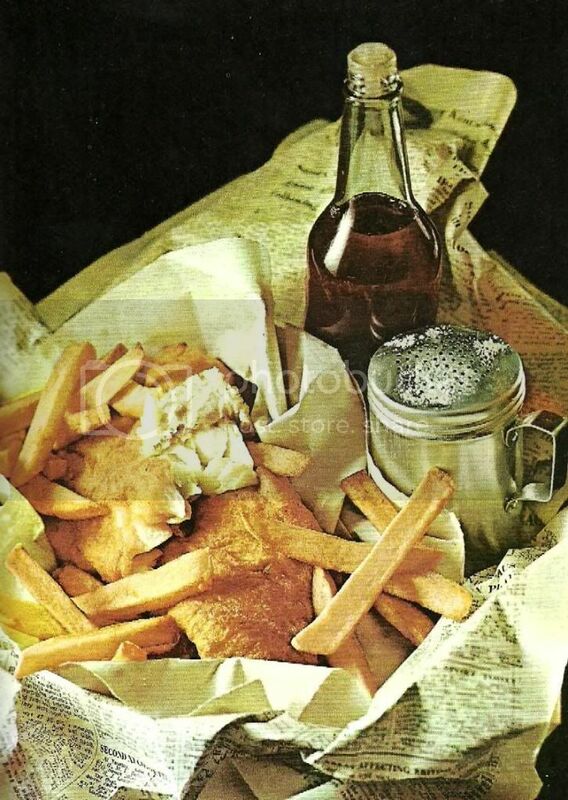 I have been having fish and chips for 40 years and I had never heard of them (but they do sound interesting). Also I have never seen a sober person eating a pickled egg in my life. If you go up to Scotland, they have a reputation for deep-frying anything (including mars bars and pizzas). the pickles did taste good - certainly something i wouldn't have thought of on my own. scotland and the US must have much in common. i was just hearing the other day about deep-frying marshmallows and twinkies! They can deep fry their haggis if they want to. but I still won't eat it! Chip shop haggis is different from ordinary haggis. It is quiet nice, more like a black pudding with barley added. my thanks to mrs. gareth! i will gve it a try! I know that Alton Brown from "Good Eats" says to drain on a rack instead of on paper, and avoid holding in a gas oven to prevent food from being soggy. those sound like good tips, and i'll be sure to try the rack next time. thanks for posting! I made this recipe tonight and was very pleased with the final product. I used Guiness Draught for the beer and was a bit disappointed there wasn't more beer flavor but otherwise it was perfect. Thanks for posting it up! glad that you tried it and liked it! i've noticed making beer breads and pizza dough with beer etc. that there isn't as much beer flavour as i would expect. i figure that it blends and gets lost in there a bit among the wheat in the flour, but i am not sure. Any thoughts on how to increase the beer flavor? Would doubling the amount of beer do the trick?